Cups, Beakers, Goblets & etc. This web page will be used for drinking vessels of many descriptions as well as various small cups and bowls with liners. The categories will include the basic single-handled Cups, the handle-less Beakers, the stemmed Goblets, the generally larger Presentation Cups of many forms, the Cocktail & Wine Cups which also appear in many forms, and Bouillon, Demitasse & Sherbet Cups which generally have liners of glass or china. In some cases when an object might fit into several of these categories an arbitrary placement has been made. 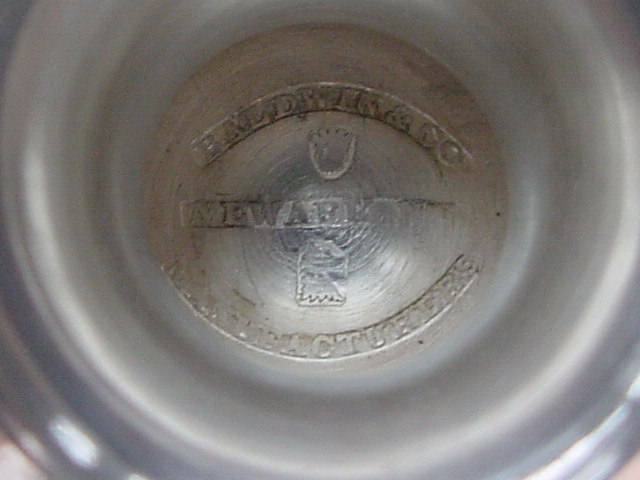 In addition, more of the smaller and later single-handled cups may be found with Baby & Youth Silver. 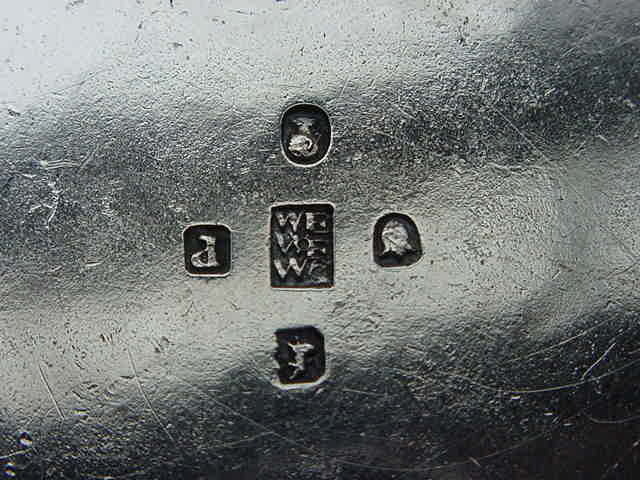 Antique American silver from this web page of Civil War vintage and earlier will also be listed on our Coin Silver Holloware web page together with all holloware from that early period. If a piece is marked Hold it has been reserved by a customer, if it is marked Paid we have received a check, and if it is marked Sold the transaction has been completed. To examine our latest additions please check out our New Listings. Please use the inventory number during correspondence to help us identify a particular item. 1549-06. Antique American Silver Presentation Water Goblet with globlular form bowl above a hexagonal stem divided by a beaded disk knop ending on a molded shallow spreading foot, the bowl and foot engraved with freehand floral and engine-turned decoration; unmarked. 7.12" high, 2.88" lip diameter, 3.25" foot diameter, 8.4 troy oz. $ 700. Script engraved Civil War presentation "Lt. Col. Geo. L. Andrews.U.S.A. from the Officers of the 17th U.S. Infantry at Fort Preble, Me. Jan.1.1865." Then Major Andrews was commanding officer at Fort Preble during the Battle of Portland Harbor in June 1863 when Confederate raiders entered the harbor and captured and fired the U.S. Revenue Cutter Caleb Cushing attempting to escape; this goblet was presented after his promotion and posting to the 13.th U.S. Infantry at Newport Barracks Ky. In 1871 he was promoted to Colonel and commanded for the next 21 years the 25.th U.S. Infantry, one of four African-American regiments in service. 1493-15. 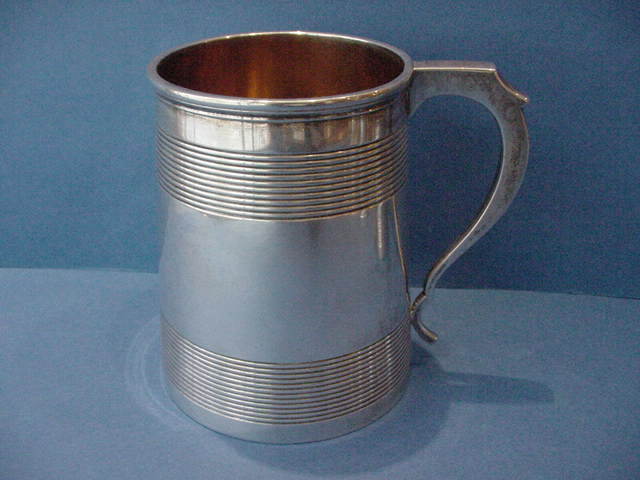 Antique George III Silver Tankard of classical form, the tapering cylindrical body decorated with upper and lower bands of horzontal rings, very slightly domed cover with cast thumbpiece, applied molded rim and flat panel double scroll hollow handle; marked I•R for John Robins at London in 1789/98. Foliate scroll script mono "WSW" cover. 6.88" high, 6.5" long, 3.75" lip diameter, 4.25" foot diameter, 4 cup capacity, 28.8 troy oz. $ 2,800. 1554-40. 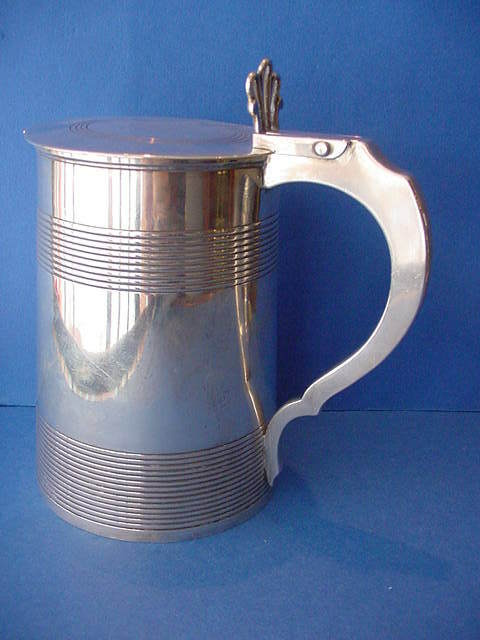 Antique American Silver Youth Cup of cylindrical form with short narrow vertical reeding above the tucked-in ring foot, plain hollow c-scroll handle; made by Bigelow, Kennard & Co. of Boston MA. Engraved "FRANCIS MINOT RACKMANN." in shaded Roman small caps on the barrel and "June 4, 1887. From Buckminster and Sarah Alvord Brown" in script on the base. 3.62" high, 3.0" lip diameter, 2.5" foot diamter, 4.38" length across handle, 7.8 troy oz. $ 325. 1532-57. Antique American Silver Large Cann of tapering cylindrical form with paneled scroll handle, the sides engraved with two bands of multiple narrow horizontal molding and applied with molded foot and lip rims; marked by Amable Brasier of Philadelphia PA, c.1795-1820. Feathered script mono "SMB". 5.12" high, 3.5" liop diameter, 3.88" foot diameter, 5.5" length across handle, 16.3 troy oz. $ 2,600. 1552-66. Antique American Silver Small Youth Cup of tapering cylindrical form with applied molded and beaded lip- and foot-rims, the sides chased with floral repousse decoration, hollow s-scroll handle (#1); made by the Gorham Mfg. Co. of Providence RI c.1850-1860. 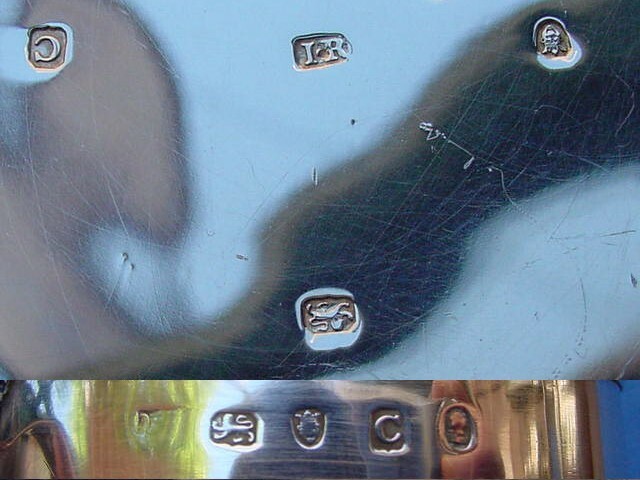 Script engraved "C.R.D. from C.H.R. ", presumably from a god-parent. 3.38" high, 2.5" lip diameter, 2.12" foot diameter, 3.75" length across handle, 2.4 troy oz. $ 200. 1554-10. Antique American Silver Youth Cup of baluster form on a ring foot, the sides chased with foliate scroll repousse decoration between applied molded and beaded decoration; marked by Gould, Stowell & Ward of Baltimore MD, working 1855-1858. Script presentation "Henry Stein from his Grandmother". 3.38" high, 2.88" lip diameter, 2.12" foot diameter, 2.75 troy oz. Seam recently repaired but missing handle. $ 125. 1553-66. 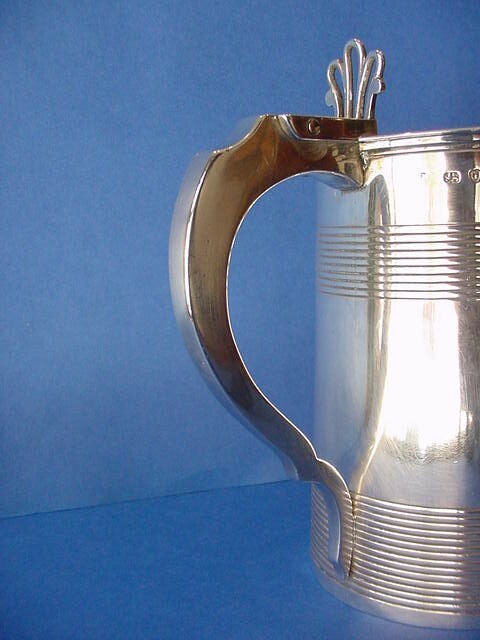 George V Silver Youth Cup in a reproduction of the William III style of tapering cylindrical form with applied foot-, lip, and mid-rib moldings, applied hollow s-scroll handle with beaded rattail decorative motif; struck with the britannia silver standard (.9584) hallmarks and marked by C.S. Harris & Sons Ltd. at London in 1914/15. Script mono "NH". Some dings. 3.75" high, 2.62" lip diameter, 3.12" foot diameter, 4.5" length across handle, 8.1 troy oz. $ 450. 1563-66. Antique American Youth Cup of cylindrical form with moulded lip- and foot-rims, the sides chased allover with floral repoussé decoration, the cast double-scroll handle chased with foliate decoration (#29); made by the S. Kirk & Son Co. of Baltimore MD, c.1900-1915. No mono. 3.38" high, 4.0" long, 2.6" lip diameter, 5.5 troy oz. Upper handle joint carefully repaired. $ 550. 1493-18. Antique George III Silver Large Cann of classical form, the tapering cylindrical body decorated with upper and lower bands of horizontal rings, applied molded lip rim and flat panel double scroll hollow handle; marked with a worn I•? possibly for John Robins at London in 1801/02. 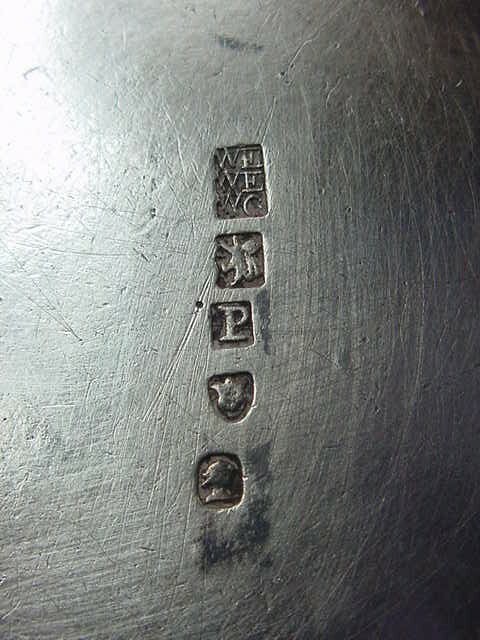 This has the same script mono "WSW" as the 1798/99 Tankard above. 4.75" high, 3.25" lip diameter, 3.75" foot diameter, 5.25" length across handle, 13.7 troy oz. $ 1,200. 1553-65. Antique American Silver Youth Cup of cylindrical form with tucked-in base above molded spreading foot, wide applied milled band with parading children decoration on the sides, applied molded lip and cast foliate decorated double scroll hollow handle (#5470); made by the Tiffany & Co. of New York NY. Script engraved "WCA" and "Feb. 9th 1885." 3.44" high, 2.81" liop diameter, 2.5" foot diameter, 4.0" length across handle, 8.75 troy oz. $ 850. 1548-28. 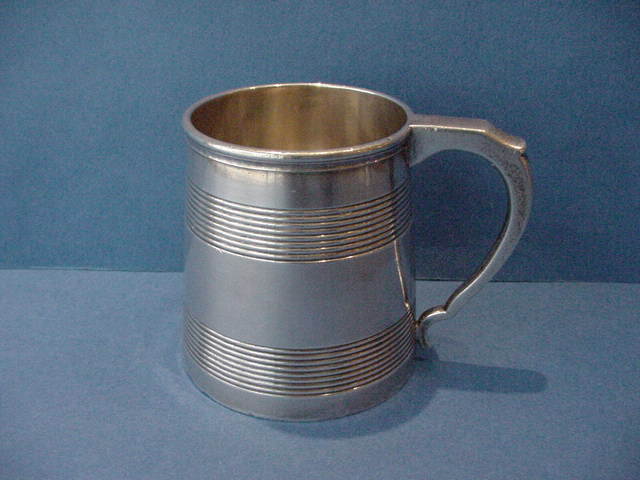 Antique American Silver Youth Cup of tapering cylindrical form with hollow angular handle, the body with horizontal banding at base and below lip, gilt interior (#14); marked by W.K. Vanderslice & Co. of San Francisco CA, c.1858-1880. Mono or inscription erased. 3.56" high, 2.5" lip diameter, 2.88" foot diameter, 4.0" length across handle, 5.5 troy oz. $ 500. 1549-05. 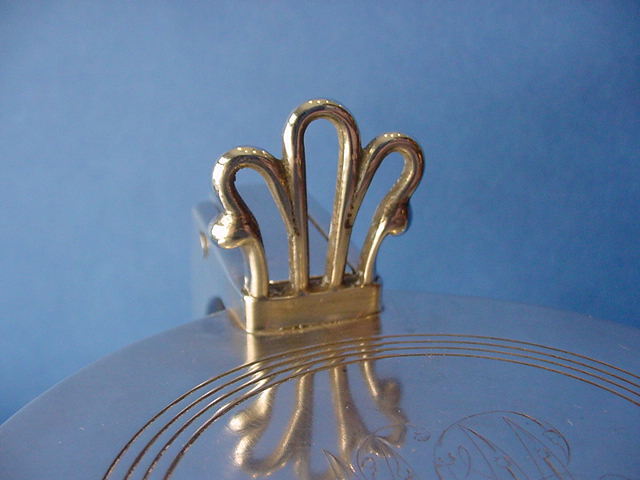 Antique American Silver Cann of tapering cylindrical classical form on molded ring foot, applied molded lip, two sets of horizontal banding, paneled double scroll hollow handle; made by Andrew E. Warner Sr. and struck with the Baltimore City marks used by assayer Thomas Warner in both 1817 and 1823. Script mono "B". 4.0" high, 3.0" lip diameter, 3.38" foot diameter, 4.75: length over handle, 7.8 troy oz. $ 1,800. 1551-25. Antique American Silver Youth Cup of barrel form with hoop and acid-etched stave decoration, the d-form bollow handle chased with an aesthetic floral decoration on each side, gilt interior; marked by George W. Webb of Baltimore MD. Engraved on side stave "Alan P. Smith Jr. Nov 16th 1873". 3.88" high, 2.5" lip & foot diameters, 3.25 largest diameter, 4.62" length across handle, 8.3 troy oz. $ 600. 1493-16. Antique Chinese Export Silver Cann of classical form, the tapering cylindrical body decorated with upper and lower bands of horizontal rings, applied molded lip rim and flat panel double scroll hollow handle, gilt interior; struck with the "WE/WE/WC" mark pseudo-hallmarks used by an unidentified Canton silversmith c.1820-1840. No mono. 4.38" high, 3.25" lip diameter, 3.56" foot diameter, 5.0" length across handle, 14.7 troy oz. $ 2,200. 1493-17. Antique Chinese Export Small Silver Cann of classical form, the tapering cylindrical body decorated with upper and lower bands of horizontal rings, applied molded lip rim and flat panel double scroll hollow handle, gilt interior; struck with the "WE/WE/WC" mark pseudo-hallmarks used by an unidentified Canton silversmith c.1820-1840. No mono. 2.75" high, 2.25" lip diameter, 2.62" foot diameter, 3.5" length across handle, 7.1 troy oz. $ 1,200. 1054-06. Antique American Silver Beaker of tapering cylindrical form with engraved oval ribbon reserve descending from a knotted ribbon; marked thrice SB on base, c.1780-1810. 3.31" high, 3.25" lip diameter, 2.5" foot diameter, 4.5 troy oz. Polished surface, mono erased from reserve. $ 600. 1564-46. Antique Swedish Silver Large Beaker of tapering and flaring horn form on a spreading swirl lobed gilt foot, a wide band of floral and scroll engraved decoration below the gilt lip, gilt interior; struck with maker's mark MORMAN by Anders Morman at Stockholm in 1790. Old(?) script mono "MOS:GED." 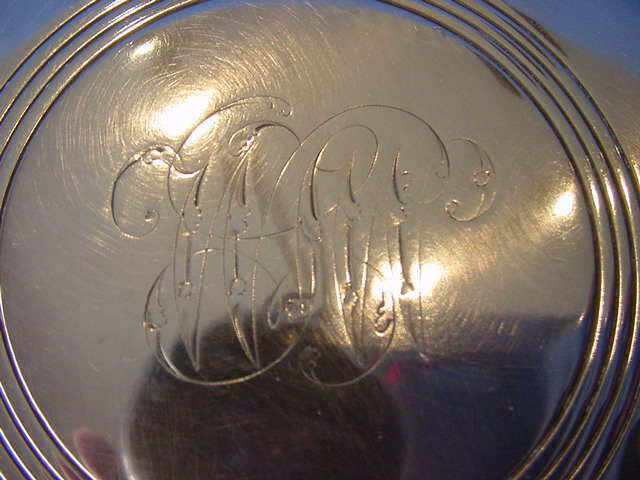 on side and engraved script "EES" and "42 2" near marks on base. 8.38" high, 6.38" lip diameter, 3.88" foot diameter, 17.5 troy oz. Later script presentation "Skanska Faltridtklubbens 3 je pris Malmo den 3/6 1894 Rattler" possibly for a horse or boat. Possibly old inscription erased prior to 1894 presentation. $1,750. 1444-01. 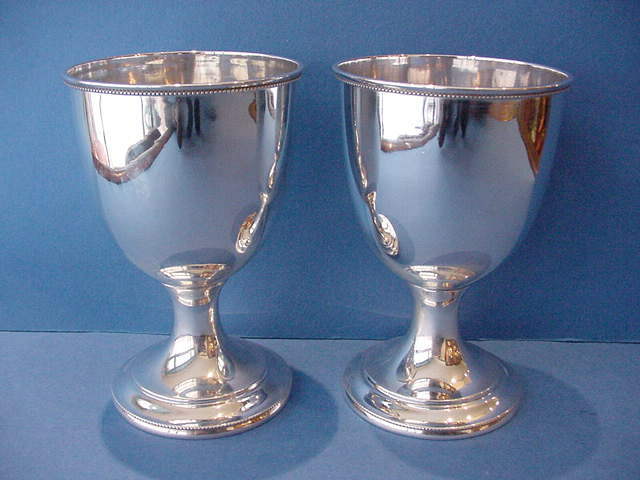 Pair Antique American Silver Water Goblets with bell form bowl on molded trumpet foot; marked by Baldwin & Co. of Newark NJ, working 1840-1869. 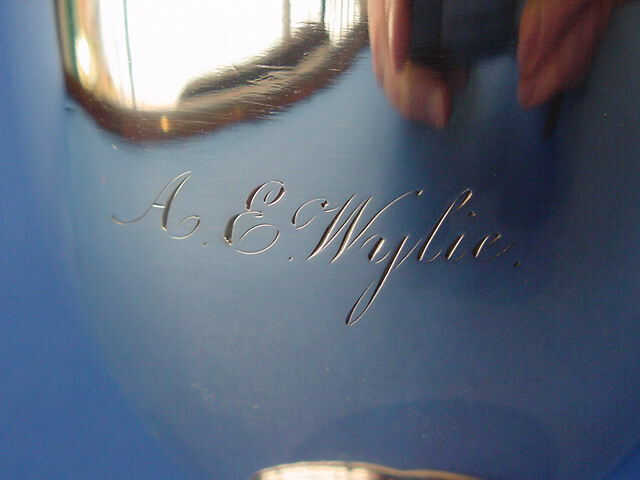 Engraved "A. J. Wylie". 5.0" high, 3.25" lip diameter, 2.75" foot diameter, 7.6 troy oz. total. Incomplete applied grapevine decoration has been removed and the pieces have been polished. $ 1,000. 1544-01. Antique American Silver Presentation Water Goblet with campana form bowl on a trumpet foot, the bowl and foot chased with floral repousse decoration; made by Andrew E. Warner of Baltimore MD. Engraved script presentation "TO James M. Anderson From the Avalon Fund Association of Baltimore. 1857." 6.5" high, 3.0" lip diameter, 2.44" foot diameter, 7.05 troy oz. Part of a larger set; years ago we had the pitcher and we have seen a goblet (either this or another) sold before. $ 800. 1533-66. Antique American Silver Water Goblet with bell-form bowl on a stepped trumpet foot, the bowl chased with vines and hanging floral swages on a matted background, the foot stem similarly decorated below a curved disk knop; apparently unmarked. Script engraved in one of two reserves "T.D. Witherspoon Jan 18th 1876". 6.5" high, 3.5" lip diameter, 3.0" foot diameter, 7.0 troy oz. Recently repaired. $ 500. 1239-19. 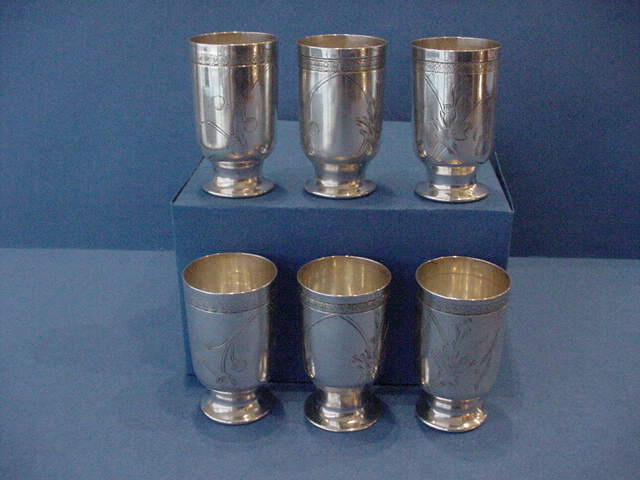 6 Russian Silver Wine Cups of cylindrical form with pinched section above the flat base, different milled bands under the rim, the body engraved with fruit and floral reserve; marked CK possibly for Cemen Kazakov at Moscow 1908-1917. No mono. 2.31" high, 1.31" lip diameter, 1.12" foot diameter, 5.8 troy oz. total. One with small rim split. $ 420. 1548-35. Antique American Silver Egg Cup, the shaped and lobed bowl above a lobed shaped square pedestal foot; made by William Gale & Son of New York NY in 1852. Script mono "JAT". 3.12" high, 2.25" lip diameter, 1.62" foot diameter, 2.15 troy oz. gross. Lead soft solder repairs at stem. $ 95. 1493-25. 8 Vintage American Silver Sherbet Cups of champagne goblet form with plain bombe stem, the bowl and foot chased with floral repousse decoration (#150); made by the Stieff Co. of Baltimore MD c.1935. No mono. Glass liners engraved with foliate decoration. No mono. 4.56" high overall with glass liners, 3.2" foot and bowl diameter, 3.88" glass lip diameter, 32 troy oz. A few small chips to glass edges. $ 2,000.